Infinitely Close to Life, The Ultimate Technology for Saving Human Life, Life Saving Water. as living organic fluids in the body. "V.O.W. Concentrate" is a drops for health drink which is created by the world's only "WonYong Pi(π)-Water Concentrate Technology(Highly-refined Concentrate Solution)". 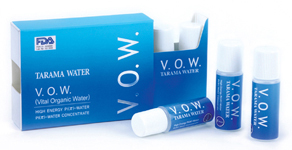 A Few drops of V.O.W. Concentrate into water makes Vital Organic Water™. You can add to any drink. 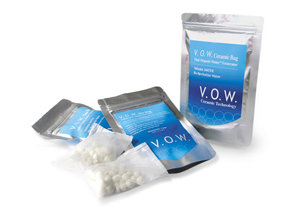 Enjoy Miraculous effects of V.O.W. Concentrate! WonYong π-Water is induced from the highly energized state of infinitesimal amount of ferric ferrous salts that have excellent antioxidant effect(V.O.W. Concentrate & TARAMA Pi-Water Ceramics are core substances for life that have the strongest antioxidant action in the world.) of protecting human bodies from active oxygen(=free radicals) that causes various diseases and stresses(removing harmful active oxygen cause cancer, diabetic, hypertension and etc. ), neutralization actions from harmful toxins(Controls oxidation reduction reaction ; detoxification action) and prevent rotting(inhibition of microbial growth, such as virus and bacteria) in the intestines. In addition, they have calcium antagonism(Calcium antagonist properties), high vital activation energy(Life energy), small water molecule structure, contains abundance oxygen, equal pH to body(pH Balance), boost immune system, and bio memory and the ability to transfer biological information, etc. Its vital functions are the closest to those found in the living organic fluids. It contribute to maintain healthy bodies and youth by protecting the cells and DNA's, protecting our body from harmful elements, and strengthen immune system, normalize body functions by cell activation. It changes tap water to healthy WonYong Pi(π)-Water. It will make better health condition of your body. It makes wonderful healthy drinking water. "WonYong Pi(π)-Water Cartridge" is the WonYong Pi(π)-Water generator which is created by the world's only "WonYong Pi(π)-Ceramic Technology(Highly-energized π-Ceramic)". Putting WonYong Pi(π)-Water Cartridge into water makes WonYong Pi(π)-Water. Enjoy miraculous effects of WonYong Pi(π)-Ceramic! The key to Wellness and Longevity. with hard-to-cure diseases & incurable disease. disease free, long life and extended life expectancy. WonYong Pi(π)-Water technology supported by Korea government. WONYONG is the only genuine π-Water(authentic quality) manufacturer in the world.